Broomfield is a suburb of Denver, Colorado and is nestled against the Rocky Mountains. Sporting a population of nearly 56,000, Broomfield is the 16th most populous city in the state of Colorado. 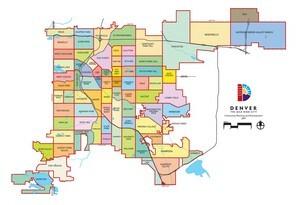 Although part of the larger Denver metropolis, the city of Broomfield was not incorporated until 1961, making it one of relatively younger townships in the area. The name of Broomfield comes from the broomcorn that is grown in the region and used for a variety of products. Since its founding, Broomfield has grown considerably over the decades and reached into three adjacent counties, Weld, Jefferson and Adams. Today, the city of Broomfield is now its own county, the smallest in Colorado. Although rural farmland is a part of the Broomfield tradition, the backbone of the modern economy is technology. Broomfield is host to a number of technology-oriented companies that supply much of the job market for the area. Today, Level 3 Communications is the largest employer in the area with over 2,000 employees. Other leading companies include Oracle, Hunter Douglas and Urban Lending Solutions. However, Broomfield offers a wide number of employment opportunities and features a number of noted small businesses. The diversity of businesses along with the temperate climate of the Broomfield area makes this one of the better communities in the region to find a wide range of employment opportunities. Because Broomfield is a singular county, it features two large public high schools that were recently renovated along with a Catholic elementary and high school, Front Range Academy and a number of elementary, middle and private schools. Although the focus of the Broomfield area in terms of economics may be technology, one of the prime attractions of this township is the open range and frontier that this city offers. Broomfield has an extensive system of trails among the nearby lakes and parks in the city. One of the most stunning features is the scene trail that connects Josh’s Pond and Sterns Lake that is located on the west side of the town. One of the features that Broomfield citizens take pride in is the 9/11 memorial that actually contains a piece from one of the Twin Towers. Broomfield also features a large skate park and many different outdoor activities designed for families. The Broomfield housing editions are generally young in nature and feature a strong variety of homes that range from small, budget oriented editions to large, plush multi-story homes. The emphasis on parks, recreation and entertainment has helped Broomfield expand its attractive neighborhoods and entice people from all over the US to move into this remarkable area. As one of Denver’s most vaunted suburbs, Broomfield has grown steadily into one of the most attractive small towns in the region. Featuring the perfect combination of technology, modern neighborhoods and splendid rural attractions, Broomfield is quickly becoming one of Denver’s fastest growing suburbs as well as one of the best small towns in Colorado.